I've been on a knitting kick this week. It started with the Nancy Bush workshop on Tuesday. 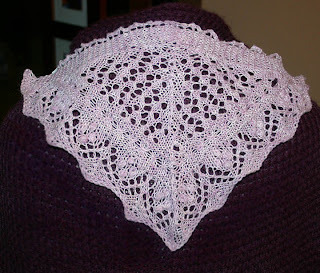 I was determined to finish the shawl sampler, hopefully in time for today's guild meeting. Made it! 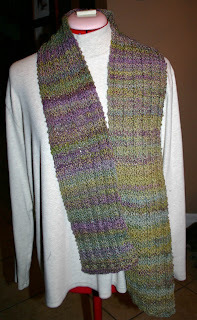 I finished knitting this - nupps and all - last night about 6 pm. This is definitely the most complicated knitting project I've tackled. I'm very pleased with how it turned out. 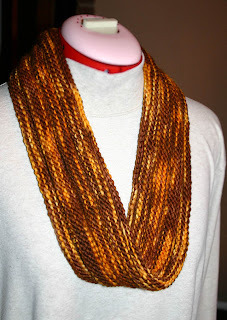 One of my goals for the Ravelympics was to finish this handspun scarf I started knitting in 2007. Earlier in the week I decided this should be done in time for guild too. Nothing like a deadline to get me motivated. Wove in the ends and put this on the blocking board last night about 7 pm. And as long as I was fishing for WIPS*, I grabbed this on my way out the door this morning and finished it up during the guild meeting. It had languished since the Cat Bordhi workshop in January while I finished up baby blankets. It's a little short - I'll cast on more stitches next time. But it's soft and it's DONE. *Works In Progress. Details for all these projects are on my Ravelry page.